Hearts manager Gary Locke admits it's "a blow" losing Jamie Hamill for next week's Edinburgh derby following the stand-in captain's red card against Ross County. 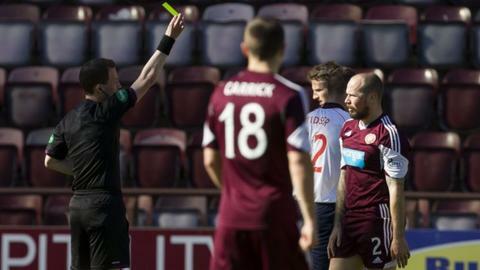 Hamill provoked a touchline tussle which involved County boss Derek Adams after scoring a penalty in Hearts' win. "He'll now miss next week so it's a hard one," Locke told BBC Scotland. "To be fair, there were too many bodies in front of me so it'd be difficult to pass comment on it." Dale Carrick scored a late second for Locke's side, who celebrated a win at the end of a week which saw the club take a major step towards coming out of administration. "I'm delighted with the response of the players going down to 10 men," Locke explained. "They kept playing and I was delighted to see us get a second goal. "We thoroughly deserved the three points. "It was a penalty, from where I was. It was a foul. Hamill's tucked it away very nicely and then they've pushed forward. It was a great counter-attack and a great finish from Dale Carrick at the end. "It's been a good week, a really good week, a really positive week. I felt it was important at the end just to show our appreciation to the supporters because you see the crowd that we had today; magnificent turnout. "When people look at games, they might think that they're meaningless and look at the support we had. "It's been a good week for everyone connected with the football club and it was important that we topped it off with a win at the end of the week." Businesswoman Anne Budge aims to complete a takeover of Hearts after creditors approved the sale of shares and she took in the victory over County at Tynecastle. "Delighted for Anne, she's a fan and she's the same as myself; she just wants to see Hearts winning," Locke said. Though relegation had been confirmed before the Scottish Premiership split, Hearts are on a four-match unbeaten run going in to their final meeting with Hibernian this season, with Terry Butcher's side only three points clear of the relegation play-off spot. "It'll be a good game," added Locke. "It's a game that everybody looks forward to. "Our fans will go down there in huge numbers again. If we put in a similar performance to today, hopefully we can get a favourable result."